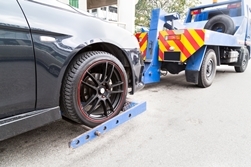 What Happens When Your Car Is Repossessed in Virginia | The Consumer Law Group, P.C. People may make jokes about the “repo man,” but when a repossession agent arrives on your property to take your car, there is nothing funny about it. If you default on your car loan payments, the lender has every right to take the car back. Under Virginia law, lenders don’t even have to notify you that you have defaulted on your loan. Once the default period—as outlined in the contract you signed—has passed, the lender can simply contract a repossession agency to collect your car. Repossession agents work on commission. They are usually paid around $350 to find and collect cars from owners who have defaulted on their loans. Because they are often chasing after people who know they have defaulted and are trying to hide their cars, they do not call ahead and they will take any opportunity to seize the car they are after. The more effort it takes for them to locate and secure a car, the more they will charge for their services. Those charges are passed back to the car’s owner and are added to the loan amount they have left. In Virginia, repossession agents are not allowed to “break the peace” when seizing a car. This means they cannot use physical force or make threats in the process of taking the car. They may not break into a locked garage to take a car either. For these reasons, agents often wait until a car’s owner is not home, or may even follow the car and seize it from a public parking lot. The agent will arrive with a tow truck and simply hook up the car and drive away. To save money in the long run and make the process easier on yourself and your family, you may choose to voluntarily surrender the car to the repossession agent, especially if you have indeed defaulted on your loan. You will have an opportunity to get the car back before it is sold at auction, but you will have to take quick action and pay what you owe, plus additional charges. Voluntarily surrendering the car does not mean you do not owe the payment or amount you agreed to pay. If the creditor or repossessor says your loan will be forgiven if you voluntarily surrender the vehicle then get that in writing.